1958-1959 Cleveland College, Management, Instructional Computing Off., WRU Mathematics and Statistics Dept. 1959-1961 Bureau of Business Research, Cleveland College, Management, Instructional Computing Off., WRU Mathematics and Statistics Dept. 1961-1963 Bureau of Business Research, Cleveland College, Management, Instructional Computing Off., WRU Political Science Dept. 1963-1965 Bureau of Business Research, Cleveland College, Management, Instructional Computing Off., WRU Philosophy Dept. 1965-1968 Bureau of Business Research, Cleveland College, Management, Instructional Computing Off. 1968-1969 Dively Center, Cleveland College, Management, Instructional Computing Off. 1971-1972 Dively Center, Cleveland College, Management, Instructional Computing Off. 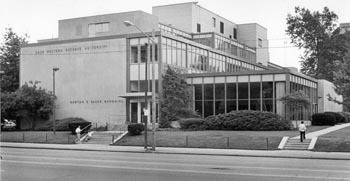 1972-1974 Dively Center, Western Reserve College, Management, Instructional Computing Off., Continuing Education Off. 1985-1986 Development, Instructional Computing Off., Graduate Studies, Library Science, Western Reserve College, Undergraduate Studies Off. 1986-1987 Development, Instructional Computing Off., Graduate Studies, Western Reserve College, Undergraduate Studies Off. 1987-1990 Development, Instructional Computing Off., Graduate Studies, Undergraduate Studies Off. 1990-1991 Information Systems Off., Alumni Office, Development, Instructional Computing Off., Graduate Studies, Undergraduate Studies Off. First University building razed in the 21st century.